Public servant and lawmaker Franklin M. Drilon has been serving Filipinos and the country since 1986. Upon the opening of the 16th Congress, Drilon was elected, for the fourth time, to the third highest position in the land, the Senate Presidency – a post he had previously held from April to November 2000, from July 2001 to June 2004, and from July 2004 to June 2006. During the 15th Congress, Drilon chaired the Senate Finance Committee and the Joint Congressional Oversight Committee on Public Expenditures. As chair of both committees, Drilon successfully sponsored the swift passage of the General Appropriations Act for the years 2011, 2012, and 2013. Recognizing his exemplary leadership, the Inter-Parliamentary Union (IPU) elected him as its President in 2005. From 2006, he was chair of the IPU Committee on Human Rights of Parliamentarians. He is a member of the IPU executive Committee. Prior to his stint as senator, Drilon first served as Deputy Minister of Labor and Industrial Relations in 1986 under then President Corazon C. Aquino. He later became Labor Secretary from 1987 to 1990. In 1990, he was appointed Justice Secretary, and in 1991, he became Executive Secretary. During the term of President Fidel Ramos, in 1992 to 1995, he was again appointed as Justice Secretary. 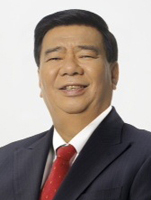 Drilon entered the University of the Philippines in Diliman in 1965 and took up Bachelor of Arts in Political Science. He then enrolled at the UP College of Law in 1969 and placed 3rd in the Bar Examinations. Prior to joining the government, he was the managing partner of the Angara, Concepcion, Cruz, Regala, and Abello Law Offices. In 2002, Drilon partnered with the Federation of Filipino-Chinese Chambers of Commerce and Industry to build classrooms using his PDAF. To date, approximately 1,800 classrooms have been constructed at half the cost of the regular school building program by the government. Drilon led several clean up drives for the polluted and dying Iloilo River, and allocated funds to build the Iloilo River Esplanade. At present, he is working on the construction of the Iloilo Convention Center, also his brainchild project. He was also the pivotal force behind the approval of the P11.2-billion Jalaur River Multi-Purpose Project-Stage II. Born November 28, 1945 to Cesar M. Drilon, Sr. and Primitiva Magtunao, Drilon’s humble beginnings began in Molo, Iloilo with his early education in the public school system, when he graduated from the Baluarte Elementary School in 1957, and high school at UP Iloilo College in 1961.